Top to bottom Rainforest Views ** Hot Tub! ** Quake Proof and Cozy! Our hearts go out to our neighbors in Leilani Estates. May you all find peace and quiet soon. There is no ash fall-out or any other debris located on this property since this event. The air quality has been good and the skies have been blue outside the normal rain received in Volcano. The lava flow is located 25 miles and 3000 feet lower in elevation away from the property. This is a magnificent opportunity to get close to the action during the day and stay safe in a perfect location at night. There Is No State Of Emergency Volcano Area and The property is SAFE! There is no immediate danger to the Volcano Village area and its subdivisions where we are located. Traffic flow to and from Hilo and Kona are fine and passable. Please check with Hawaii Volcanoes National Park for any possible closures that may affect your hiking plans. I will update here as needed. USGS reports that it is safe to travel in and around Hawaii Island. I just installed a brand new Hot Tub! ‘The house was nice and clean. Lots of extras which we appreciated borrowing: ice chest, flashlights, umbrellas, reusable tote bags. Loved the extra warm and cozy blankets'. This house is located in one of the last high-altitude rain forests in the U.S. centrally located, near the village of Volcano (altitude approx. 3600 ft) four miles from the entrance of Hawaii Volcanoes National Park in the heart of the Big Island of Hawaii. Only 30 minutes from Hilo and 2 hours from Kona. The house is decorated with island art and comfortable seating areas. Your every need will be met. Enjoy creating your meals in our well equipped, well-lit kitchen or dine out at one of the many restaurants in Volcano Village or inside the Volcanoes National Park. From fine dining to casual there's something for everyone's taste and budget. Enjoy a glass of wine in the evening while gazing at the immense star-filled sky or the romantic outside lighted ferns from the floor to ceiling windows in the living room. Cuddle up in comfort in the living room & watch a movie using the Roku Streaming Player or listen to your own iPod or iPhone connected to the stereo system. Then enjoy a peaceful night’s sleep in our luxurious beds. This is where you will find a truly peaceful, relaxing getaway. In the morning have your coffee on the lanai (deck) while watching local birds feasting at the birdfeeder and playing in the surrounding fern forest while you consider your days adventure from the numerous list of options provided in our 10-page introduction email. This house consists of a downstairs bedroom with queen size bed, spacious living room with cathedral ceiling and full-size convertible sofa, complete kitchen and a tiled bathroom with a luxurious spa-size tub with private views into the forest. This property is very private. You can not see any neighbors due to the very dense tropical rainforest. There is a roomy upstairs bedroom with a Queen size iComfort Sleep System by Serta bed and a futon including 4 inches of full-size memory foam to use anywhere you wish. The upstairs bedroom is accessed from the living room by way of a securely fastened ships ladder. We are located only four miles from Hawaii Volcanoes National Park This is where you can view the steam vents and explore lava tubes. Some are located closer to Hilo which is all part of the same series of tubes carved out 500-700 years ago. I can provide you with information on visiting the best lava tubes on the island. For more volcano information click on the link to our website below. In Volcano Village about three minutes away you can be enjoying one of our many charming restaurants, shops or art galleries. Volcanoes National Park and surrounding areas have many beautiful hikes to choose from. Don’t forget to visit the Volcano Winery and take in a round of golf at the Volcano Golf & Country Club. The Old Town of Hilo with its Historic Tsunami Museum and bay front shopping, glorious parks and waterfalls and snorkeling beaches are a short thirty-minute drive North of Volcano. Thirty minutes in the opposite direction heading South of Volcano is one of the Big Island of Hawaii's best beaches, Punalu'u Black Sand beach. It is known for its green sea turtles and beautiful black sand. There is nowhere else you will find a community as charming and creative as Volcano Village. Hanging around the quaint Volcano Village restaurants and chatting with the locals is a great way to see and feel the Island aloha spirit. There is a mix of artists, musicians, writers and more. Be sure to make it to the local farmers market held every Sunday morning. If you love orchids there is an orchid growing warehouse just down the highway called Akatsuka Orchid Gardens. They have some of the world’s rarest and most unusual orchids. A feast of color for the eyes. You may see them blooming in our gardens depending on the time of year. At Richardson Bay, 30 minutes from the house in Hilo There are beaches with great snorkeling. This area is great for bringing the kids. There are a lot more things to do and see, there are waterfalls, botanical gardens, lava flows into the ocean (when active) and great restaurants. I can provide you with more info on all that and much more when you book your stay with us. As an added bonus there are no mosquitoes in this area because of it's cooler climate. Your host is located near-by. Should you have any special needs or requests, please let us know and we will do our best to accommodate you. I've been a business owner for an ever growing Residential and Commercial cleaning company for the last 18 years. I have cleaned other owners vacation rentals during that time and decided that was where I needed to invest my savings. I'm adventurous and I love life! I love this area of the Big Island. The temperature is perfect most of the time. The idea that the land around here is new and more land is being created all the time is fascinating to me. I could watch the lava flow for hours. I also can't get enough of snorkeling on the islands. The sea life here is absolutely amazing. I'm not sure which I love more. Come and experience it for yourself. I will be happy to share the wonders of the Big Island with you so that you will go home knowing you have had the best vacation of your life. I think the best thing I like about the house is the peace and quiet. The variety of birds and their songs are so beautiful. Listen for them at the end of the video. Mornings are the best sitting on the lanai drinking tea. The variety of plants and flowers will amaze you as they do me as I learn what will grow in this area! Something is always blooming. And the stargazing OMG the stargazing! The bath room is medium sized with a very large tub. This tub can fit to adults very comfortably. AT&T & Verizon work great here. Open the doors and let the cool tropical breezes in. There are several electric heaters to use in any room you would like. Washer and dryer are in an outside attached room. Floor to ceiling windows with a lighted view at night. Refrigerator is dorm sized. Plenty of room for orange juice, milk, eggs, beer, wine. Not big enough for a turkey dinner! Minimal freezer space just enough room for ice cream. The restaurants around volcano are excellent! Coffee maker and Bean Grinder, Blender, Microwave, Toaster. You can seat 4 people at the table and 3 others at the bar. There is a streaming Ruko Player at the house. Gets Netflix Hulu and many others. There is no satellite. We have several guide books about Hawaii and lots of coffee table books on various topics. Poker chips and cards, Scrabble, Back Gammon. Bring your own Ipod and connect it to our stereo with the handy connector provided. Fits most personal listening devices. There is a small TV that has a VHS player built in. This is great for kids or a late night movie in bed. here are the titles I have. Titanic, Little Mermaid, Midnight Express, Pulp Fiction, The banger sisters, Tears for fears live from Santa Barbara, Castaway, Analyze that, Three kings, Panic, Road house, Earth wind & fire-shining stars, Executive decision, Bringing down the house, The mummy, The matrix collector's edition, Howard's end, Caddy Shack, Underwater Hawaii Maui May 10 1999. We have many orchids and tropical plants all around the house. Large patio with table and two chairs over looking the private front yard. Feels like you're in the middle of the jungle. Arriving at night felt almost scary as the Big Island is so dark at night, and while this place is close to the main highway, Volcano village, and the national park, even just a short distance off the highway makes you feel like you are in the middle of nowhere. The hot tub was nice after a long day, it was fun to sleep up in the loft, and the lights that could be turned on to illuminate the jungle through the giant windows at night were super cool. Unique, fun, recommended place to stay if you're on the Hilo side of the island, and super close to the park if its open for hiking, or if you just want to get away from it all. We stayed here for 2 wonderful nights, two adults and 3 kids. Tracy is a lovely person and has created the perfect get-away. The house is located in a forest neighborhood. 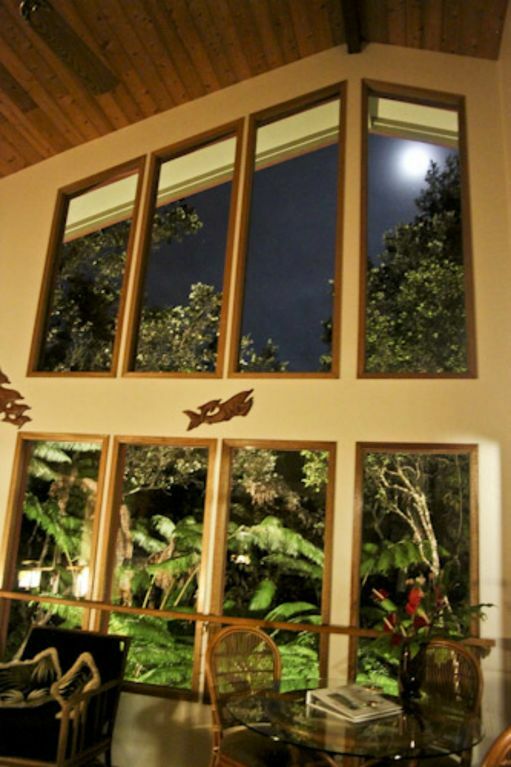 It is very private - the large windows look out to Ohia trees and ferns. The landscaping is magical. There are orchids growing on the trees, and lots of splashes of color. There is a bird feeder and Tracy provides seed. We filled it and sat in the hot tub to watch the show. A flock of nutmeg mannikins, a pair of cardinals, then doves and kalij pheasants all stopped by to eat. The kids all slept in the loft, which was an adventure for them and they did not complain. It was very comfy. The ladder is pretty steep though. My youngest is 8 and managed just fine. We would love to visit again, hopefully for longer next time. My husband and I only stayed for two days, but really enjoyed it! The house is beautiful and in excellent, clean condition. The bed (we stayed in the loft upstairs) was super comfy and cozy. I loved the outside lights you could turn on at night and look at the gorgeous ferns. Tracy was friendly and communicative. Very easy and pleasant experience! My only regret is that we didn't get to take advantage of the jacuzzi! We were just too tired after hiking and swimming and were also a bit wary of getting bitten by mosquitoes. We'd had our fair share of bites already and just didn't want to risk sitting exposed on the lanai for a long stretch. We enjoyed our stay very much and the frequent tremors and small earthquakes actually added excitement to our stay. They are harmless and the house being on stilts is really earthquake proof! No worries at all! Due to the fact that the National park is closed we had to drive a lot more but we still could see and do a lot. The highlight was the lava boat tour which is a very rough ride but well worth the money! We also enjoyed the birds and pheasants in the garden a lot! The spa was an additional treat! The communication with Tracy was excellent - she answered all our questions very quickly! The only downside was that we never could get the TV to work with the Roku system! Other than that - a great experience for us! The house was perfect for us. My daughter loved sleeping in the loft and the rainforest views out the window were pretty. The hot tub was a fun perk. The location was 5 minutes from Volcano National Park. Too bad it was closed due to the recent volcanic activity, but we spent our time in Hilo and at Black Sand Beach, both of which were equal in distance from the house. One little warning: with the volcanic activity, we got to feel our first earthquakes at the house...fun, authentic adventure! Thanks for a fun little trip! We spent 4 nights here during the craziness of the volcano eruptions and earthquakes from May 2-6. The cottage itself was just like the pictures - cozy if a bit cluttered, and definitely nestled in the rain forest. A brand new hot tub on the deck was a welcome surprise - we used it 3 of the 4 nights, relaxing while the outdoor lights illuminated the foliage. Our last "soak" was interrupted by a jarring earthquake (the last of more than 20 or so over the last few days). The location was convenient to the National Park and to the town of Volcano. We loved the Tuk Tuk food truck and Ohena Café. Not so great was Kilauea Lodge, which was more expensive and boring. When the National Park was evacuated, it was a great day trip to Punalu'u and South Point. We enjoyed the lively but small Farmer's Market on Sunday morning. The cottage had a very private and secluded location. We drank our coffee and lingered over breakfast on the deck every morning. The kitchen was well enough equipped, we got by with mini frig and manual dishwashing. Put the coffee grinder to good use! Plenty of bottled drinking water was provided because the in-house water is from a catchment basin and not potable. There were only 2 of us so we used the downstairs bedroom. Did not even venture up the ladder to see the 2nd floor loft - too many earthquakes to be climbing ladders! Tracy the owner was easy to communicate with and responded immediately when we needed help with incoming directions. She also contacted us during the earthquakes and eruptions to be sure all was OK. In short, and despite the craziness during our visit, we loved Volcanoes National Park, we loved the little town of Volcano, and would wholeheartedly recommend this cottage to visitors. And, there is much to see and do, so our 4 nights was more than justified.